Happy Friday. 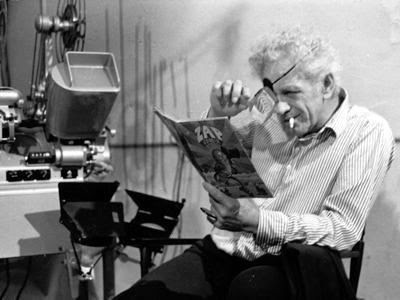 You'll notice I put up a poll on the sidebar, in which I ask readers to pick no more than 3 of their favorite Nicholas Ray movies. Unscientific, I know, but it's just for fun. I was so busy during the actual past 4 days, the poll idea didn't occur to me. So I'll leave this up for a week and see what develops. Feel free to discuss in this post's comment thread. Someone suggested it would be great if they were all in one post, so after the jump, I have gathered all the links submitted to me during the blogathon, plus a few I found on my own. Enjoy! LIGHTNING OVER RAY... the man called Nick! NICK'S MOVIE - Nicholas Ray blogathon by Dottor SINema at Drug me to movie hell!! Not fair! I didn't even see this til too late cuz I was editing Acidemic #7, but can you add my links so I can stop crying? You rock! Tony, you did a great job here and thanks! Alright fellas, I just added your posts to the link list above. Didn't mean to take so long to respond. But after an exhaustive week running the blogathon, my son being sick over the weekend, and 9/11 remembrance, etc., I thought it better to unplug until today.